Enjoy even easier control over the air in your home with your Amazon Alex! Aprilaire makes it simple to manage your home’s air quality, from controlling temperature and humidity to refreshing any room with clean air from the outside. But we couldn’t stop there. That’s why we’ve made our thermostats compatible with Amazon Alexa voice commands! Alexa makes it easier to manage your day, from setting reminders to learning about the weather. It only made sense for us to pair our air quality systems with this awesome technology. 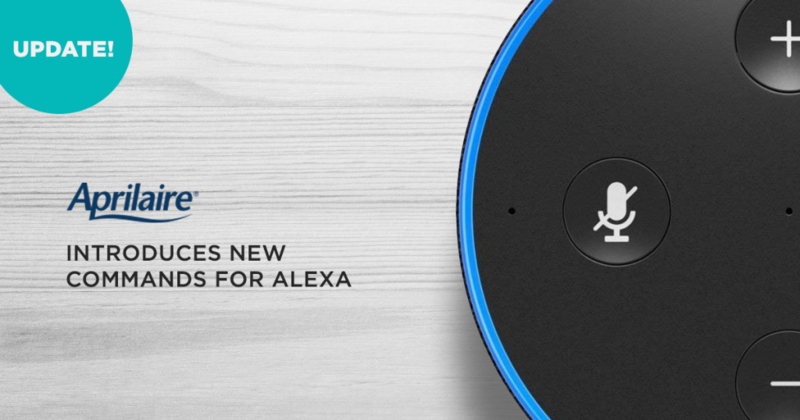 Our previous Alexa commands focused on setting your preferred temperature. Now we’ve taken it a step further with commands for several aspects of the Aprilaire system. Ask Alexa to activate Away mode, which optimizes your heating and cooling systems while you’re away from home. Check on the humidity level in your home any time. Alexa will tell you the relative humidity, which makes it easy to find the setting you prefer and experience what different levels of humidity feel like in your home. Is pollen giving you fits? Ask Alexa to start Air Cleaning, which uses your home’s air purifier to refresh the air you’re breathing so you can stay healthy throughout allergy season. Cleaning and cooking can make the air in your home stale. Alexa will start up your home’s ventilation system to flush out polluted air and bring in fresh air. You can ask Alexa for the current status of your home’s system. This gives you peace of mind knowing what is operating and when. Find out more about all of Aprilaire’s Alexa commands, and see just how easy it can be to keep your home environment fresh, clean, and happy. Previous Previous post: Black Friday Shopping Tips–Find What You Need In Record Time!